This is a brand new in the box AirFree Onix 3000 Black Air Purifier. This is the Model 3000 and comes with a 2-Year Warranty. This non-ionic unit creates NO OZONE, an element that has been recently found to cause asthma attacks and even death is some circumstances. Ionic Air Purfiers such as the Sharper Image, Oreck, Purifion and Brookstone models can produce harmful levels of ozone in your home, not a problem with the OZONE FREE AirFree air purifier. 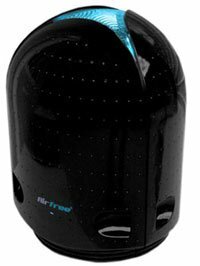 Let us introduce you to Airfree the new and clean technology to reduce indoor pollution. Inside Airfree?s patented ceramic core 99.99% of all micro-organisms: spores, fungus, bacteria, virus, mold spores, are incinerated at temperatures around 400F (250oC). That is done without significant heat contribution to the ambient. No living microorganism survives this power. Airfree's new and awarded design includes the new outstanding and highly efficient thermo dynamic ceramic core, with high room capacity that goes up to 550 square feet. Airfree reduces Ozone whereas ozone generators generate dangerous levels of such harmful gas that destroys lung tissue, triggers respiratory diseases, and corrodes metallic equipment. - Totally Silent: Some air purifiers, like Hepa filters, must operate fans at high speed to reach their highest purification level. Customers must make sure they can sleep with such noise. Airfree is totally silent. - Ozone Free: Airfree reduces 26% of Ozone instead. Purify The Air You Breathe!